Airport: Office closed. Jet Air will be open. Grave decorations: Beginning Saturday, Nov. 3, artificial wreaths, artificial flowers, or other decorations may be placed on graves for Veterans Day or for the holidays. These materials may remain in place through the end of February. If not claimed, they will be removed. ICPL Bookmobile: Not in service. Parks and Recreation: Administrative offices closed. Normal operations at both recreation centers. Refuse, Recycling and Yard Waste: No curbside garbage, recycling, or yard waste collection. Residents on the Monday route should have materials at the curb by 7 a.m. on Tuesday, Nov. 13. Senior Center: Closed. No senior meals. Streets: The City's Leaf Vacuum Program will operate. More at www.icgov.org/leafvacuum. Transit: Normal operations, and free rides will be available for veterans and their families on fixed-route City buses and Johnson County SEATS on Veterans Day. For more, call 319-356-5151. Water: Office closed. For water emergencies, call the 24-hour emergency number at 319-356-5166. 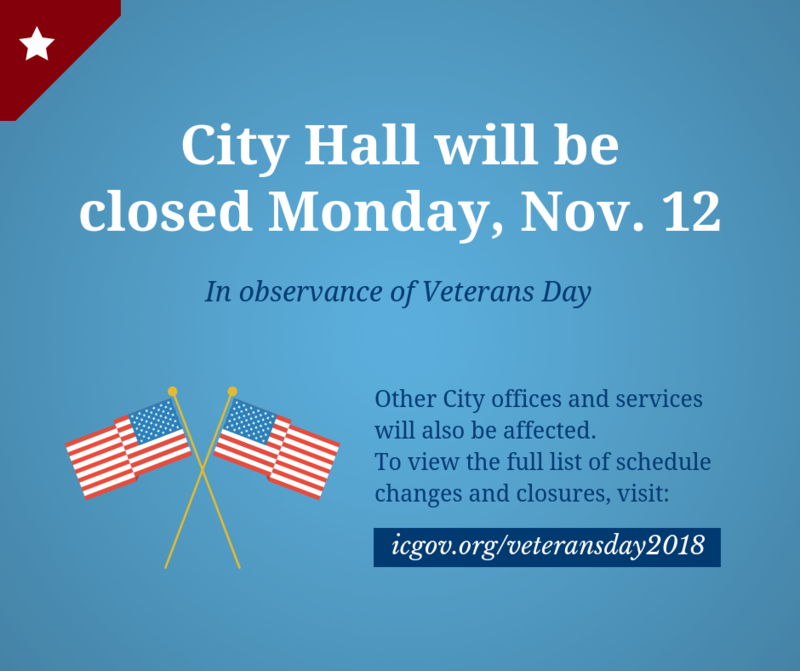 City offices and operations will return to normal on Tuesday, Nov. 13. For more information, contact Shannon McMahon, Communications Coordinator, at 319-356-5058.